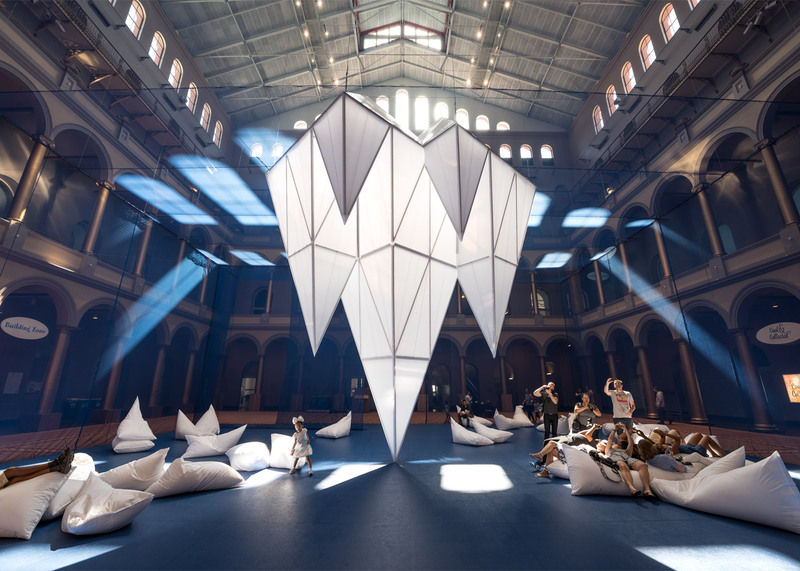 US studio James Corner Field Operations has created an installation for the National Building Museum in Washington DC that evokes a glacial landscape, with giant shard-like forms that jut upward and downward (+ slideshow). 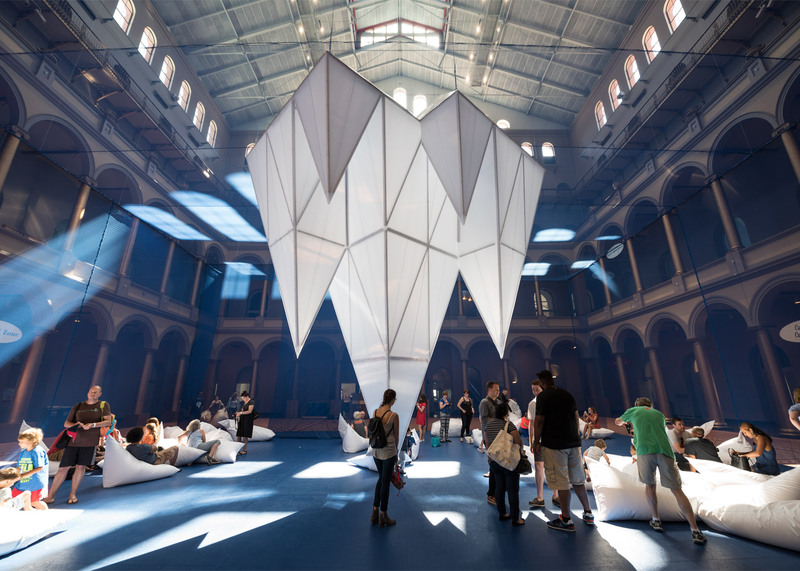 Called Icebergs, the installation consists of over 30 pentahedron and octahedron forms made of translucent polycarbonate panels. James Corner Field Operations has installed the prismatic, shard-like forms – which range in height from five to 17 metres – inside the museum's Great Hall. Some of the shards are suspended from the ceiling, while others jut up from the ground inside the installation, which encompasses 1,165 metres. The forms are contained within an enclosure constructed of blue netting to help mimic an icy, underwater scene. Some shards rise above the top of the enclosure, described as the "waterline". 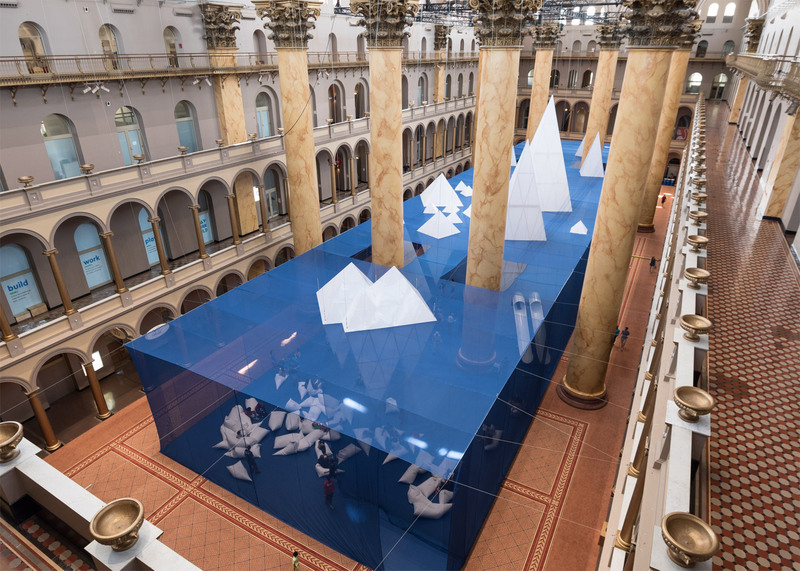 "As landscape representation, Icebergs invokes the surreal underwater world of glacial ice fields," said James Corner, founder and director of New York-based James Corner Field Operations. "Such a world is both beautiful and ominous given our current epoch of climate change, ice-melt and rising seas," he added. 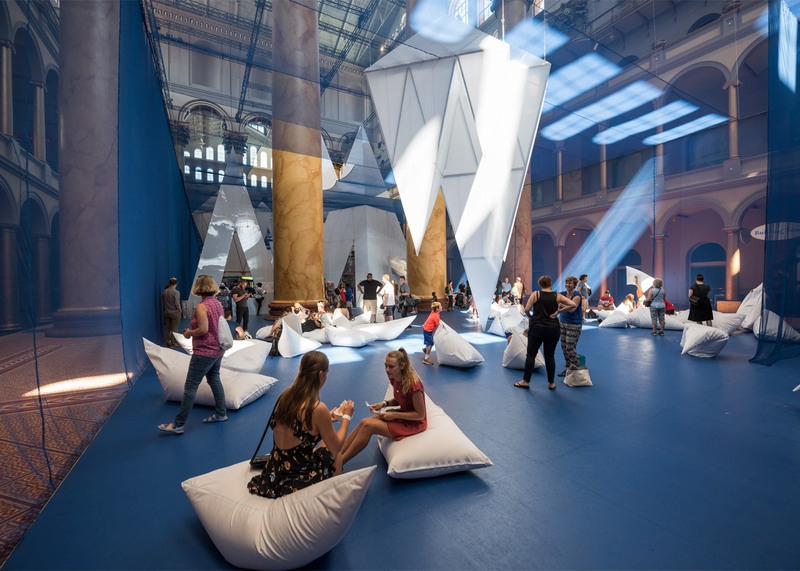 Visitors are invited to wander through the installation and sit on chunky, triangular-shaped bean bags that are distributed across the floor. One berg contains two white, glossy slides that visitors can ride down. Visitors can also ascend one of the bergs to a viewing platform that overlooks the installation. 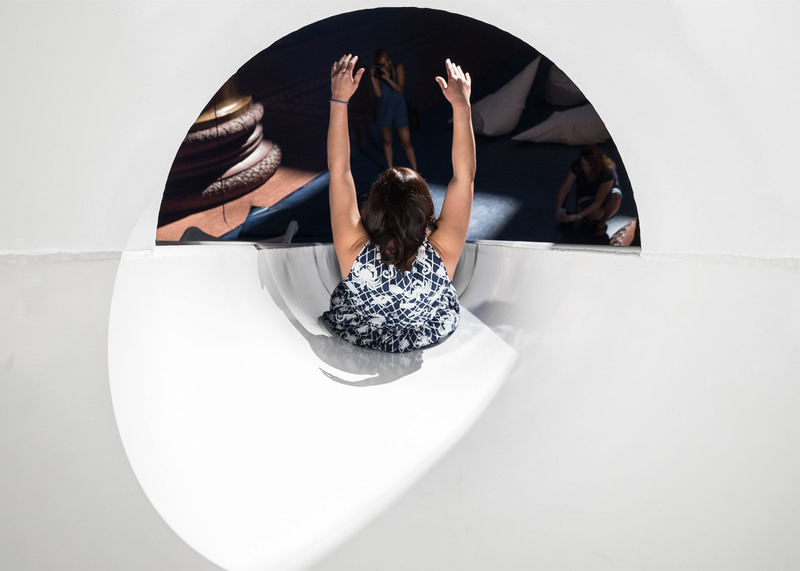 The installation is meant to serve as a space for play and reflection. According to the studio, the design is "in stark contrast to the hot, humid world of the Washington DC summer outside." Shaved-ice refreshments from a local restaurant are available for purchase. Various programs and events will be held in conjunction with Icebergs, which is on view until 5 September 2016. James Corner Field Operations is one of the designers behind Manhattan's popular High Line park. Last year, it unveiled plans for a park that would run underneath an elevated rail line in Miami. It is the latest firm to fill the museum's Great Hall with a summer installation as part of the museum's annual series of events and exhibitions known as Summer Block Party. The National Building Museum is housed within the historic Pension Bureau building designed by US Army quartermaster general Montgomery C Meigs and completed in 1887, and the soaring central hall is lined with balconies supported by eight massive Corinthian columns around the sides. 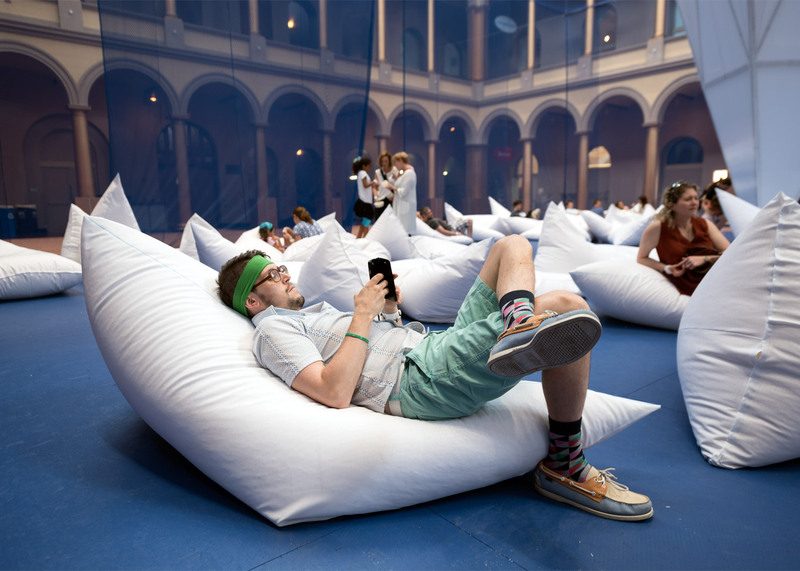 Last summer, Snarkitecture created a beach-like atmosphere in the space with a sea of translucent balls. In 2014, Bjarke Ingels Group installed a life-sized wooden labyrinth within the Grand Hall. Photography is by Timothy Schenck, courtesy of the National Building Museum.